Logan Martin, more beast than man!! All the shots Logan Martin has put up over the years are paying off. 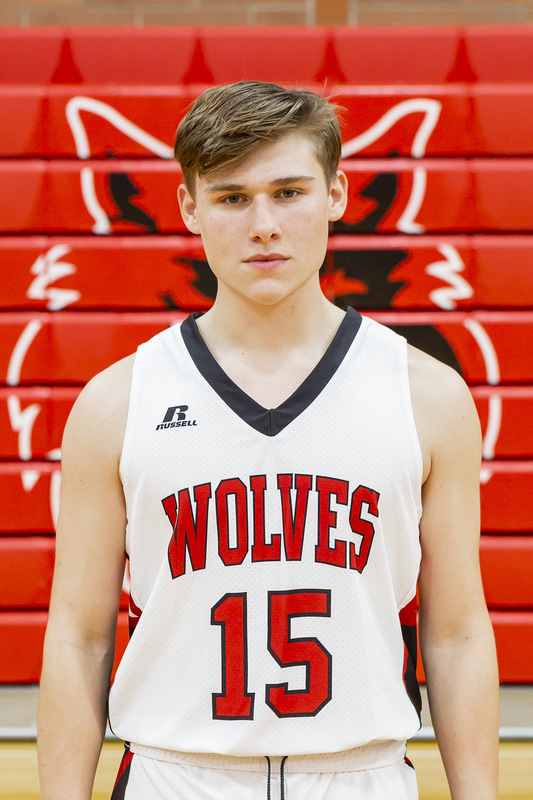 The Coupeville High School freshman has been one of the most consistent scoring threats the Wolf JV basketball squad has, something he more than proved Tuesday night. Rattling home 12 of his game-high 19 in the fourth quarter, Martin sparked a pressure-packed CHS comeback against a tough Sultan squad. Trailing by seven entering the final frame, the Wolves snatched their first lead of the game with three minutes to go, but couldn’t hold on in the waning seconds, falling 52-46. The loss, coming in the North Sound Conference opener, drops Coupeville’s young guns to 0-1 in league play, 3-3 overall. While he was hoping for a win, Wolf JV coach Chris Smith exited wearing a huge smile, pleased with the grit his team showed. Especially with virtually no bench, as Coupeville, missing three key players due to injuries and illness, only went six deep on the night. The Wolves trailed for the first 29 minutes of a 32-minute game, but never let Sultan slip too far away. That set up the potential for a fourth-quarter thriller, and Martin and Co. delivered. Down 33-26 after three quarters, CHS roared to life in the final frame, going on a 17-6 run in which Martin threw down 12 points. After hitting a sweet fall-away, slapping home a layup off of a steal, and netting a turnaround jumper in the paint, he wandered outside the three-point arc and began to rain the pain. The first of back-to-back three-balls off of Martin’s sizzlin’ fingertips pushed the Wolves up 40-39, then the follow-up stretched Coupeville’s lead to four points. He wasn’t the only Wolf making sweet music with the net, as Daniel Olson sank a long jumper under pressure and Grady Rickner hit an awkward-looking, but very-effective, three ball while being severely bumped by a defender in the left corner. Sultan was nothing if not resilient, however, immediately connecting on a one-handed runner in the paint and a three-ball of its own to reclaim the lead at 44-43. With the table set for a fingernail-chomping finale, CHS knotted the game at 44 on an Olson free throw, then snatched back the momentum with a major show of force down in the paint. Sophomore big man TJ Rickner, who has taken huge steps in his first season, yanked down a rebound in a forest of Turks, then powered back up. As he banked home the ball from up close to make it 46-44, his coach screamed “Yes, TJ, yes! !” and it was time for Sultan to collapse. But, as quickly as it arrived, the fairy tale ending evaporated for Coupeville, as the Turks closed the game on a methodical 8-0 “run” to seal their harder-than-expected win. Half of the points came via free throws, as Sultan capped a strong evening at the charity stripe by netting its final four opportunities. The torrid fourth quarter capped a game which stayed very close from start to finish. Cody Roberts splatted a long three-ball in the first quarter, while Martin was a force on both ends of the floor, dropping a mix of turnaround j’s and three balls, and also skying to reject a pair of Turk shots. Still, Sultan slipped in enough in the early going to nail down a 13-9 lead after one quarter, then stretch the margin to 23-18 at the half. Coupeville wrapped a pair of treys, one from Grady Rickner and one from Olson, around a short jumper from Tucker Hall, to keep things close in the third and set up the frantic finale. Martin’s 19 points represent his best showing as a high school player, while Olson and Grady Rickner backed him with eight apiece. TJ Rickner (4), Hall (4) and Roberts (3) also scored, as all six Wolves to see floor time scratched their names in the scoring column.